We’re getting ready to upgrade our POS system, so we’re back logged on new product (get ready for a major update soon!) so for now I’ll skip the weekly What’s New section and provide you with a comprehensive Around the Shop. 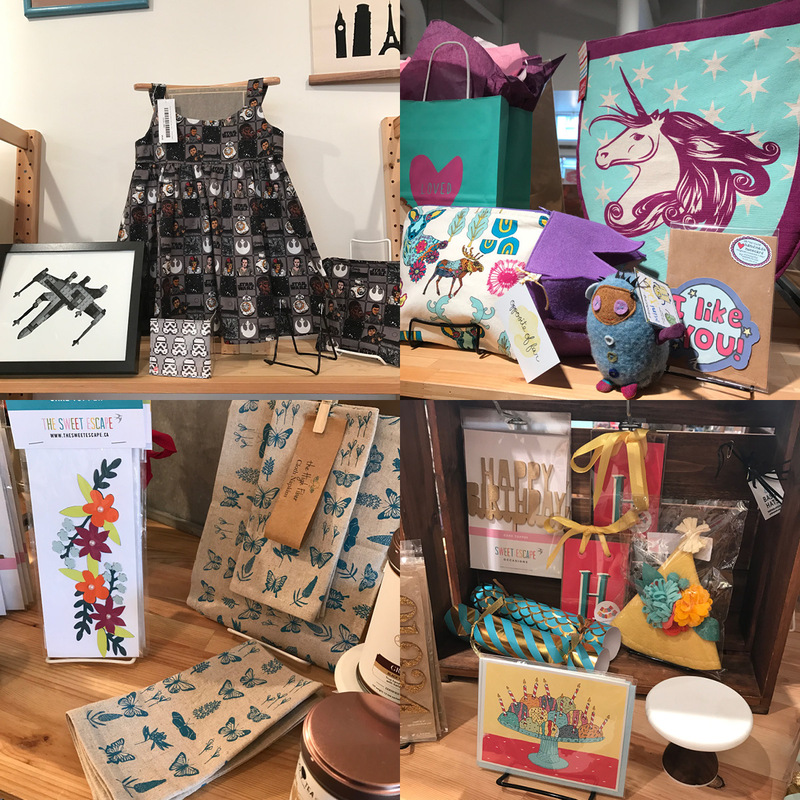 As you probably know if you’ve ever been to our shop, we have a huge variety of goodies available to browse. This means even I, who walk the shop twice a week, often come across beautiful little finds amongst the shelves that I had never noticed before. Take a look, and if you haven’t been here in a while, come and see what you can find yourself! 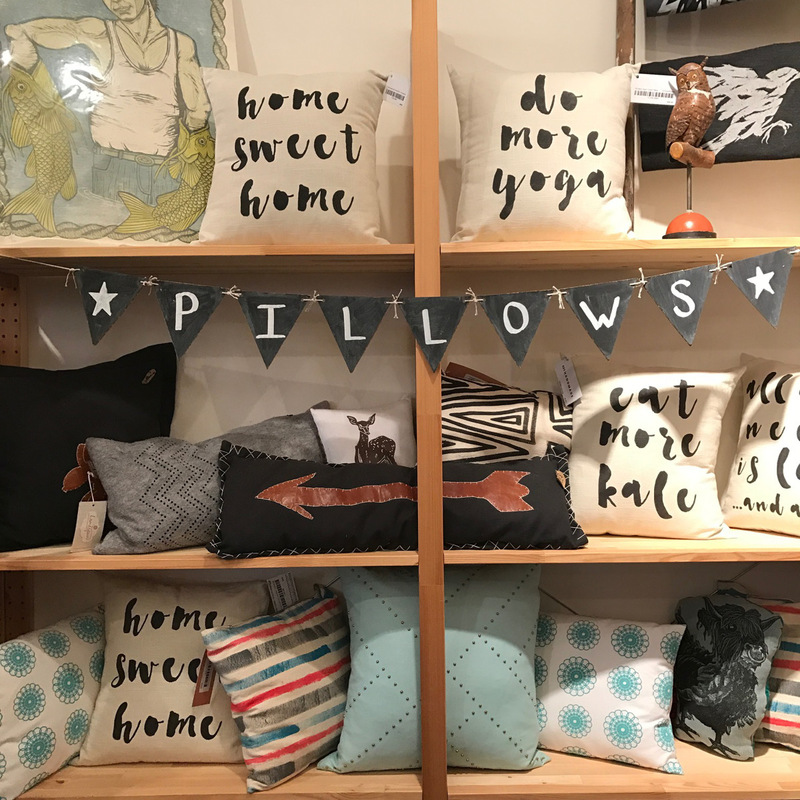 Lovely new pillow display. The perfect way to perk up your home for spring. I love the styling our staff comes up with for our shelves! Our products play together so well. 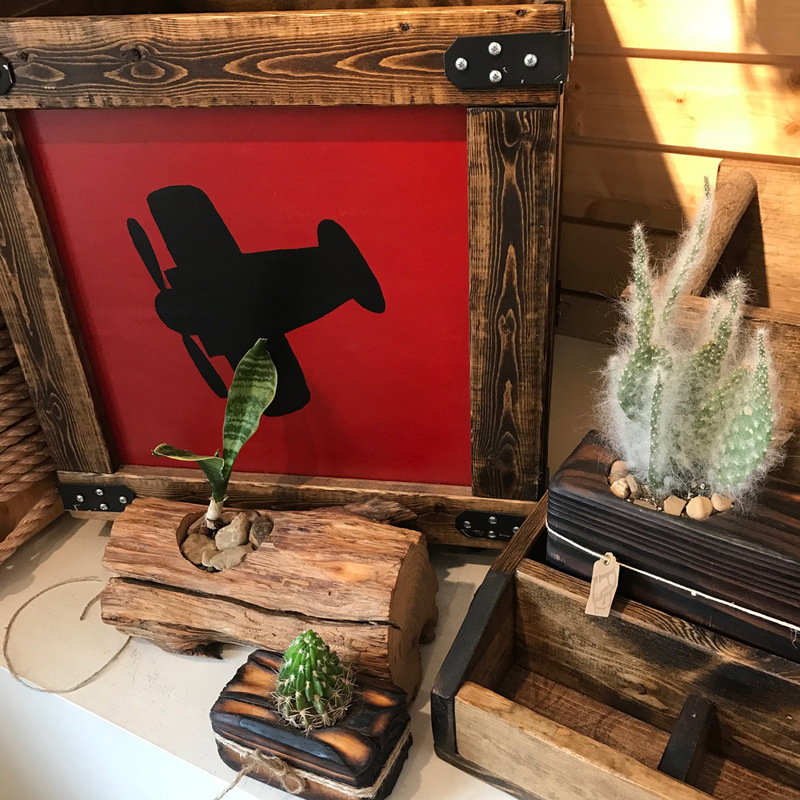 Red Barn Collective and Re: Katherine Scott creating a magical little space. 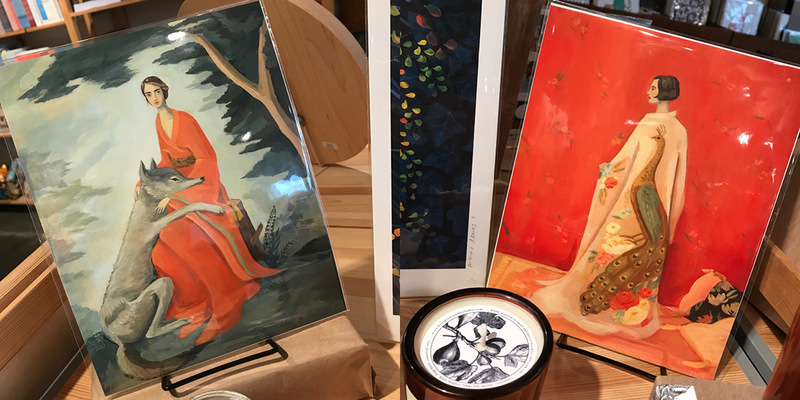 Mesmerized by these beautiful prints from The Black Apple. 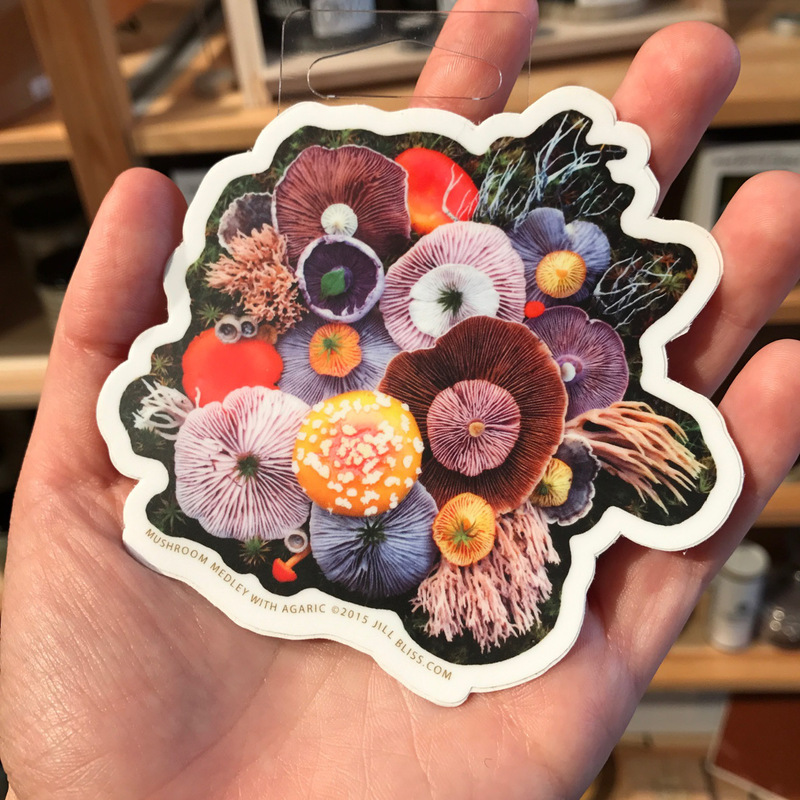 Gorgeous mushroom sticker by Jill Bliss. It’s spring time and that means our dogs will be spending a lot more time outside, these blends by Tyson & Tater will help them stay healthy and happy (bug repellent spray not pictured!). 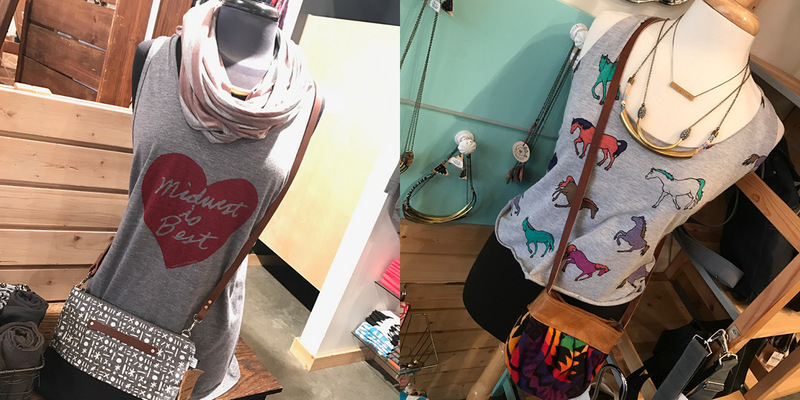 On the left: scarf by Pointelle Designs, necklace by Grey Theory Mill, tank by Megan Lee Designs, and purse by 1606. On the right: necklaces by Grey Theory Mill and Black Crystals, tank by Nicole’s Threads, and purse by ReFind Originals. 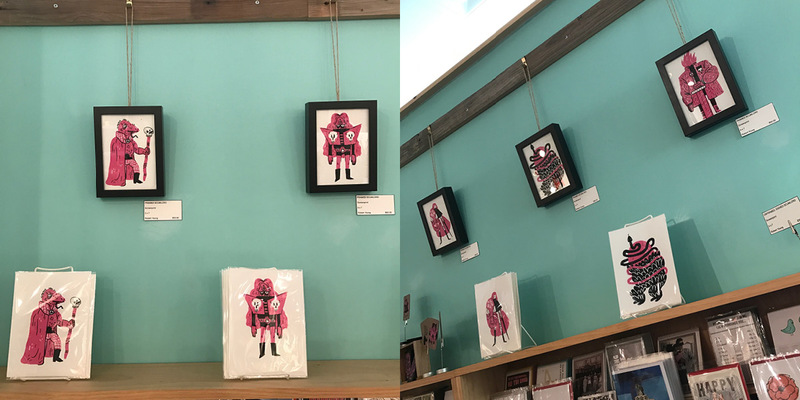 First Friday Gallery Exhibition ft. Robert Young: Friday, April 7th: 6-9pm: Join us for IDADA’s First Friday Gallery Walk in-store celebrating the work of local illustrator and comic artist, Robert Young. Graduating with a BFA in Illustration from Herron School of Art & Design, Robert later earned his MFA in Illustration at The Maryland Institute College of Art. Currently an Illustration Professor back at Herron School of Art & Design, Robert has had work featured in Time Out New York, Until Now Magazine, The Classical.org, The Travel Channel, and more. Workshop: iPhoneography: Saturday, April 15th, 1-3pm: Learn how to utilize your iPhone’s camera features to their maximum potential in this iPhoneography workshop with local professional photographer, Rana Salame. Students will learn basic photography techniques like composition and lighting as well as how to use effects to enhance images. Participants will edit photos in the VSCO Cam app to make images more creative and visually appealing. Once skills have been covered, the group will hit the streets of Mass Ave to test out newly acquired techniques. A roundtable discussion will follow to study images and next steps to continue snapping like a pro. 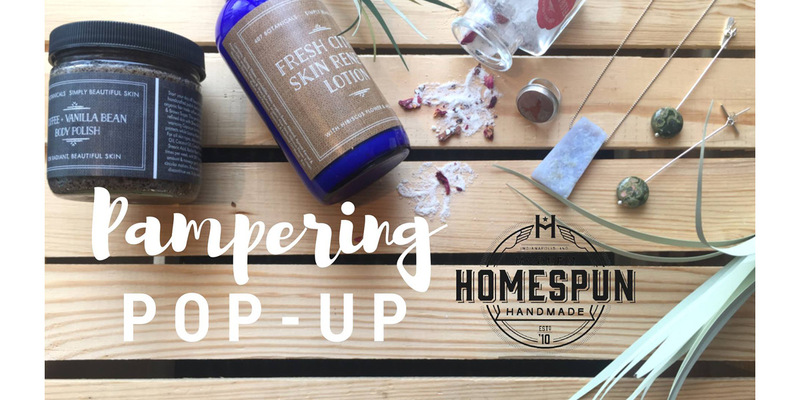 Pampering Pop-Up: Saturday, May 13th, 11am-4pm: There’s no one that deserves more pampering, attention, and relexation than Mom. 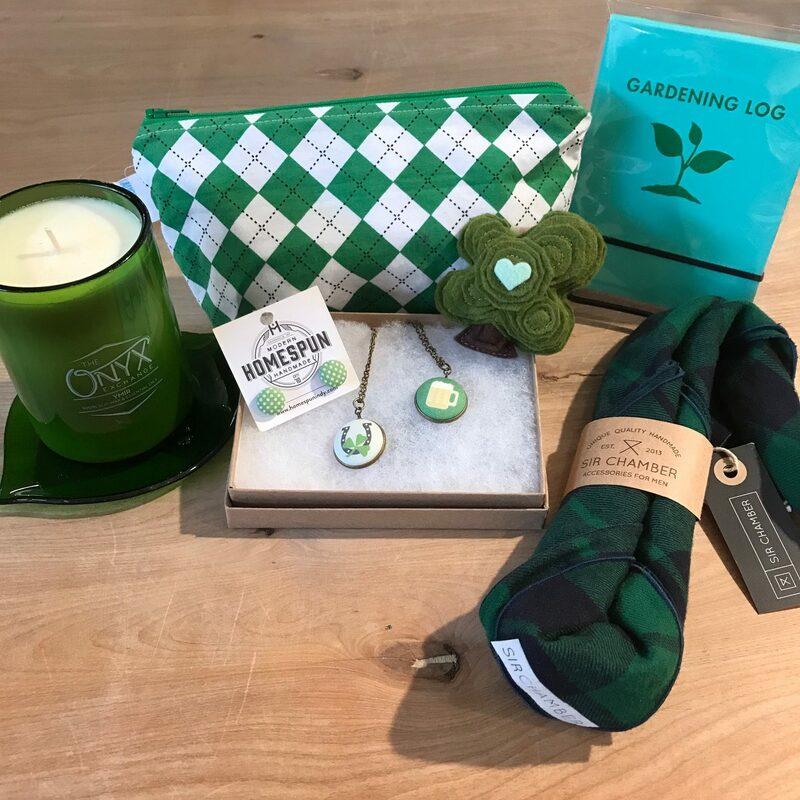 Bring her in store on this Mother’s Day Eve, for an indulgent experience featuring bath and body demo’s from 407 Botanicals and a jewelry trunk show from Sara B. Jewelry & Metalsmithing. 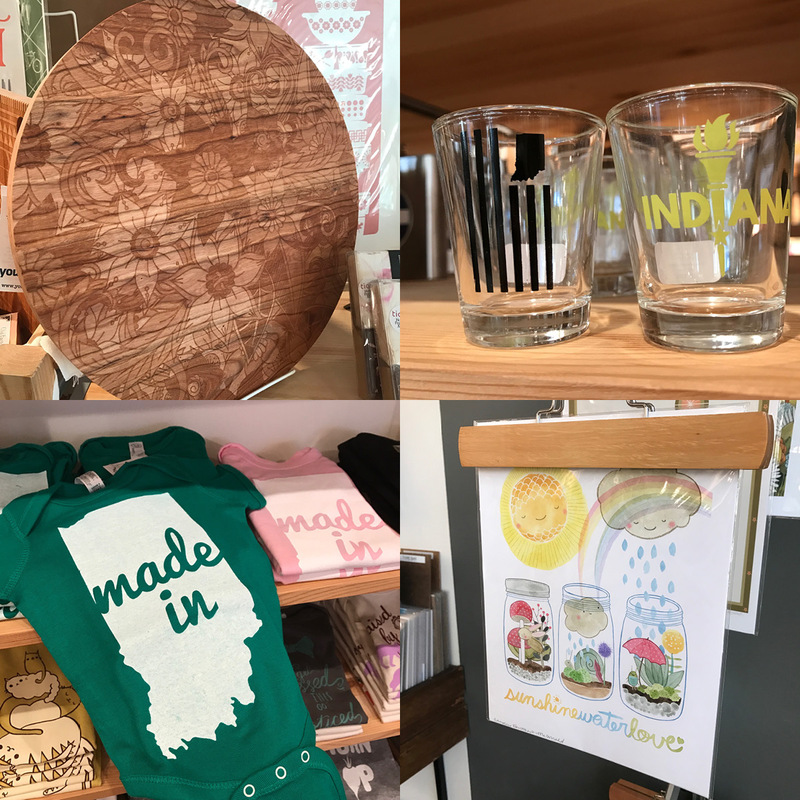 You and Mom both will also enjoy 10% off your entire Homespun purchase today. 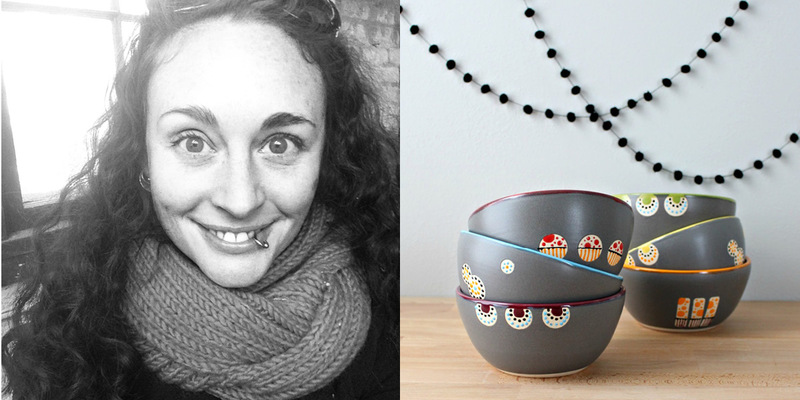 Nicky Ross of Nstarstudio makes pottery that you would think too perfect to be hand made. Which isn’t to say its without a unique and lovable character that you won’t find in your box store ceramics. Bright, crisp colors and intricate detailing make these modern pieces stand out. Her aesthetic effortlessly carries over to her fabric and embroidery work; a beautiful interpretation of modern quilting for every room of the house (check her website to see her quilts). 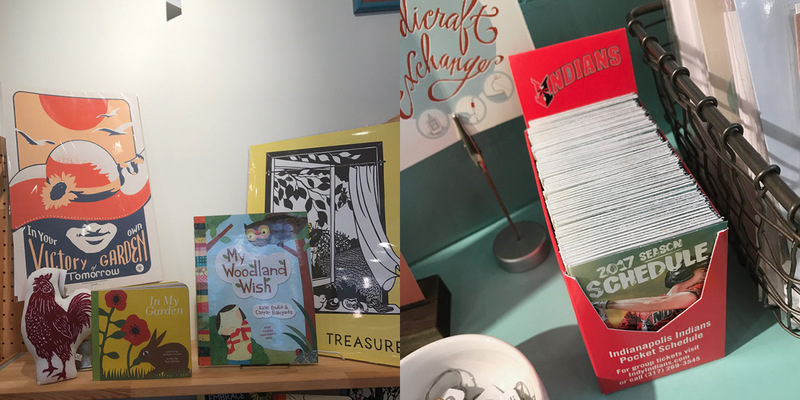 We’re so glad to see her pieces shining on our shelves! Fortunately, most people are familiar with ceramics growing up with dishes in the cupboard and plants around the house. Mostly I emphasize the fact that every piece I make is made by hand, one at a time. With a lot of mass produced ceramics, people are often surprised that I throw, trim and glaze each piece individually. I make because I always have. Because it is a force and motivation within me. Because I love it. I have always loved the beautiful nuance of handmade things and gravitated towards crafts as opposed to painting and drawing. I’m actually terrible at drawing and way more successful with 3-D design. Once I started to create with clay, it clicked. Not to say that it was easy in the beginning, it took a long time to be able to make what I was envisioning, but I loved the process and that drove me to practice the craft. There is a long history of ceramics in culture and craftsmanship. 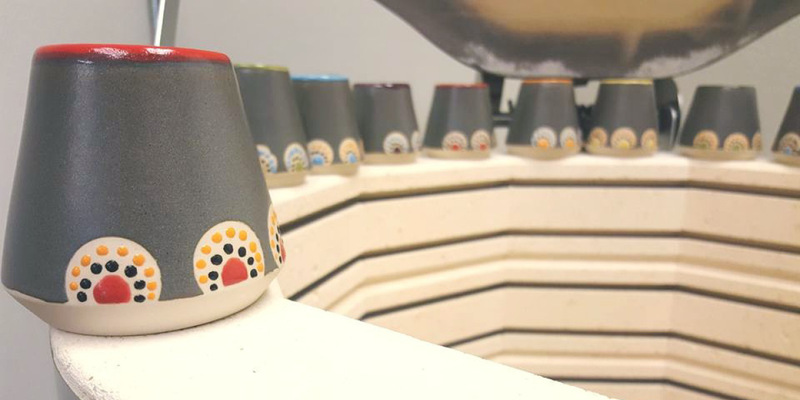 As I learned more about this connectedness between art and necessity, it made me appreciate how dishware is an elegant balance of design and function. I strive to add my own happy imprint to simple and needed objects. 3| How do you work, and where? I work out of a small studio about 1/2 mile from my house. After working in many studio throughout the years, It’s truly a dream to have my own private workspace. I generally go into the studio several times a week to make, finish, glaze and fire. Usually anywhere between 1-8 hours depending on what needs to be done and how it coordinates with my teaching schedule. Because my schedule is all over the place and varies from week to week, I try and make the most of the time I have at the studio. It also helps that based my my production background, I’m usually pretty efficient by nature. I’m not sure that being an artist was ever my plan. I’ve just never stopped making or being curious about crafts in general. I guess you could say that I never grew and in always pursuing my heart, I’ve had a fortunate path so far. I had a ceramics minor in college and decided to move to Madison, WI after I finished. 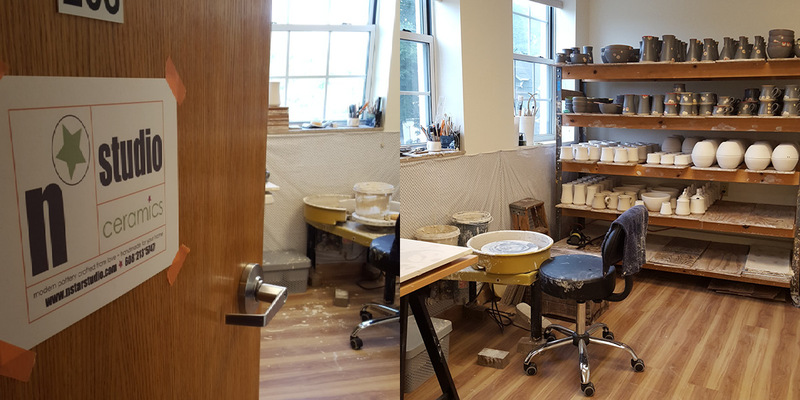 I started working at a community ceramics studio shortly after I got here and learned the real ins and outs of running a studio. It’s a lot of work and I wore a lots of hats, but it taught me everything I would need to know to have my own studio now. 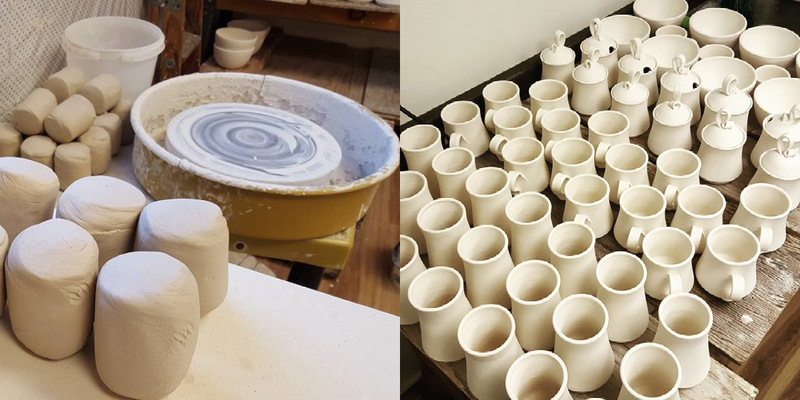 The 10 years I spent designing and decorating for a local pottery company gave me the opportunity to hone my production skills and fall in love with the influence of design on everyday things. I also teach at several studios in town and I love being able to share these skills and inspire others. 5| What do you love about your job? 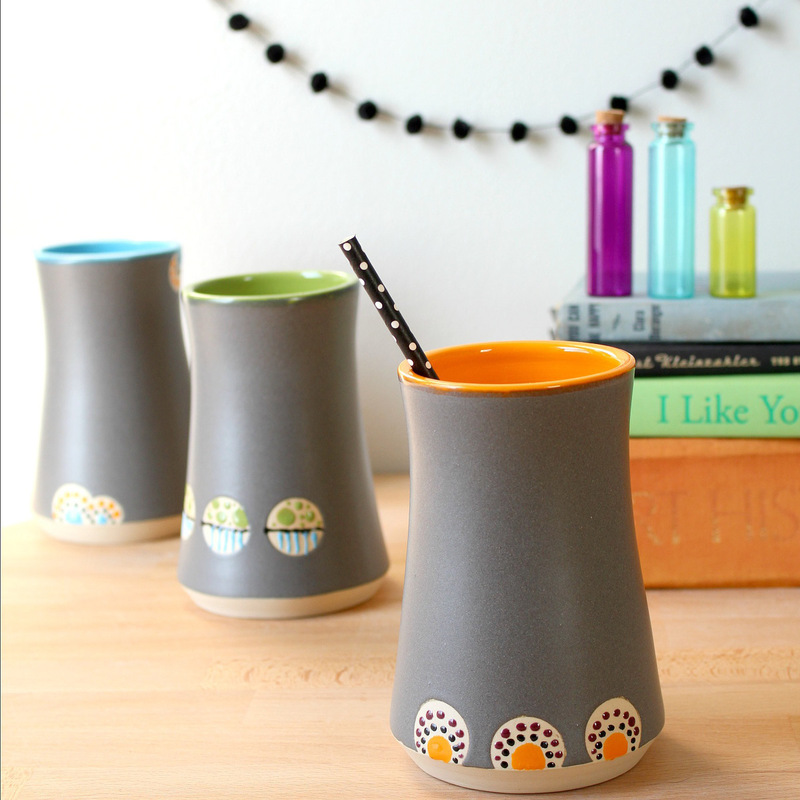 I designed and decorated for another local pottery for 10 years, so I love that I can now concentrate my creative efforts on my own line of pottery! I love that I can try out new ideas. I love that I have flexibility in my schedule. I love that I get to create things that serve a purpose in other people’s lives. I love the personal connection I have with my customers. I’m so fortunate that I get to do what I love and I don’t take that for granted! 6| I love how your work is modern, yet fun and almost whimsical. Where do you find inspiration for your designs? I would say that my inspiration comes from all kinds of places, the shapes of japanese functional forms, scandinavian simplicity, traditional folk art quilts, Art Nouveau illustrated posters, modern art paintings, wall paper patterns. And, of course the gorgeous work of so many makers, new and old. I just wish that I had more time to experience more influences on a regular basis. It can be a tough balance between being inspired and trying out new ideas! 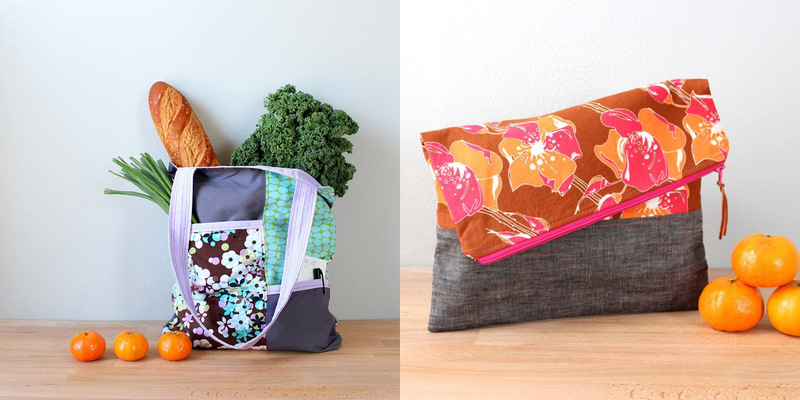 7| You work with textiles as well, creating bags, quilts and more. What brings the two processes together for you? I started sewing when I was about 10, basic things to start, then really getting into the concept of making things that I needed. Simple skirts, tote bags, and eventually quilts. I guess the same idea of functional design drew me to textiles as it did with clay. And my love of color and pattern tie the two mediums together even though they are very different to work with. I have aways been drawn to graphic quality of textiles (probably because I’m terrible at drawing!) and find it fascinating how the scale of a pattern can have a huge impact on the finished item. I try to incorporate that graphic element in my pottery and make sure all the colors get a little love. Tough call! Either Eva Zeisel or e.e.cummings. Eva was an industrial designer who worked in ceramics as well as other mediums. She brought a sense of sensuality to common dishes and elevated them with stylized beauty while maintaining their everyday function. e.e. cummings is my favorite poet and would have loved to see the world through his eyes and heart. He was able to capture the beauty in the overlooked tiny moments of life and not only put them on paper, but make his poems visual artworks as well. Most simply that it’s made by hand, not mass produced, but made with love and intention by someone. Sentiment and stories can of course enrich the value of a handmade object, perhaps something made from someone who is no longer with us or something made especially for us. 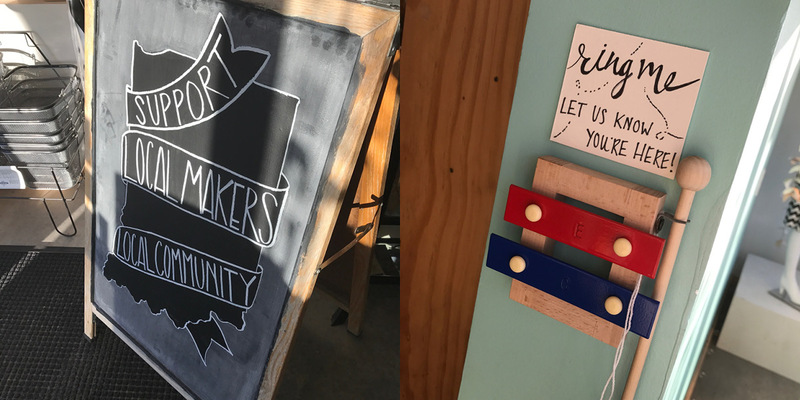 Choosing to make and using the knowledge and skills you have available at the time plus the intent to share that something with others make a handmade object very special. Anything that I have that was made by someone I know holds a soft spot in my heart. And all of the handwritten notes, letters and cards from my love, Rob are priceless. I was a poet. I went to school for creative writing. I spent many years writing poetry, edited several poetry journals and used to perform at poetry slams. Since focusing on ceramics, it’s fallen by the wayside, but I always think about getting back into it. -I’m terribly uncoordinated. I got kicked off my t-ball team when I was little because I couldn’t hit the ball! -I love to travel. If I had more money, I’d spend it seeing the world. I’ve traveled to 12 countries and can’t wait to experience more! 13| Any new product lines on the horizon? Plans for 2017? I had a couple of studio moves between 2015 and 2016, so I’m actually really excited to have a more permanent place to be able to experiment with new ideas. Business-wise, I’d like to try out a few new shows and grow the business now that I have a stable studio. Creatively, I would love to play around with some new colors and develop new patterns to keep those timeless functional pieces fresh. For more NStar, check out her website, Etsy shop, Facebook, or see her work in person here at the shop! 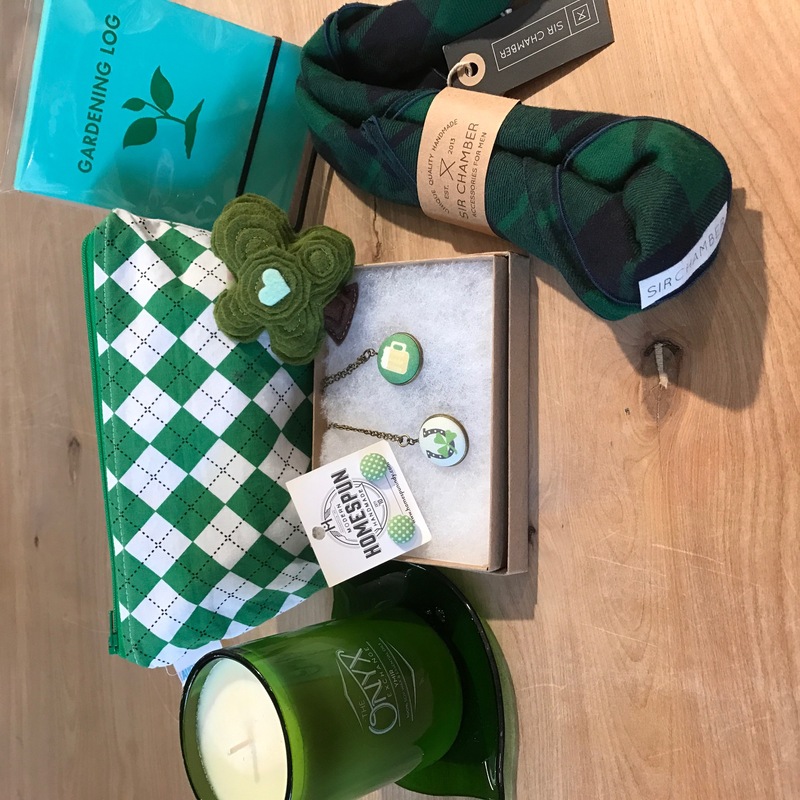 Did you know Saint Patrick’s Day is celebrated in more countries than any other national festival? If Wikipedia says it, it must be true! Better find a little bit ‘o green to wear on the 17th and support your fellow Irishman. We’re here to help! 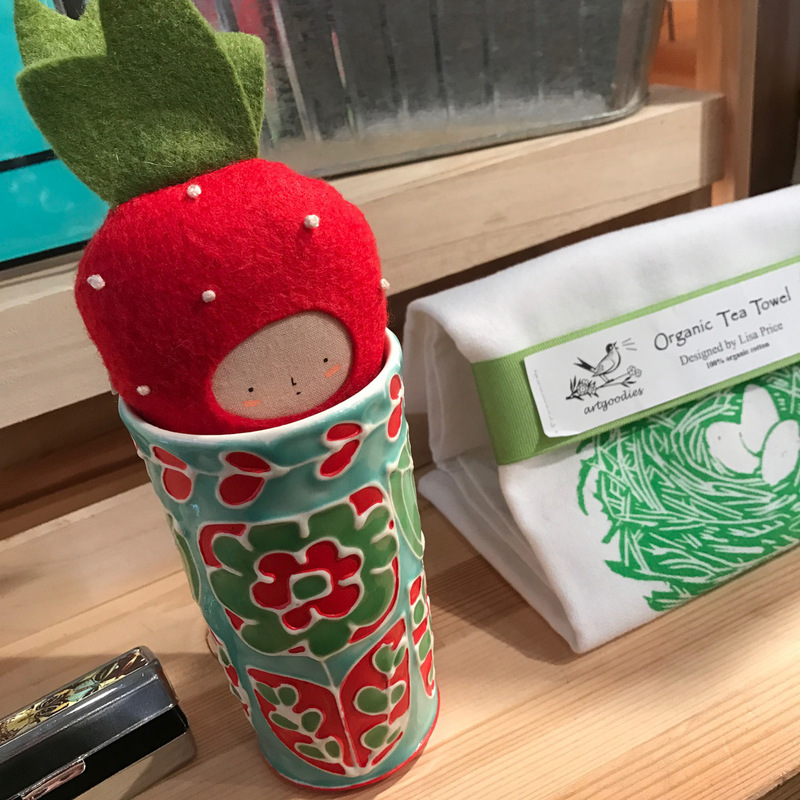 This cheery little strawberry by Happy Grey Skies is peeking out of a tumbler by Staci DeBolt Pottery. 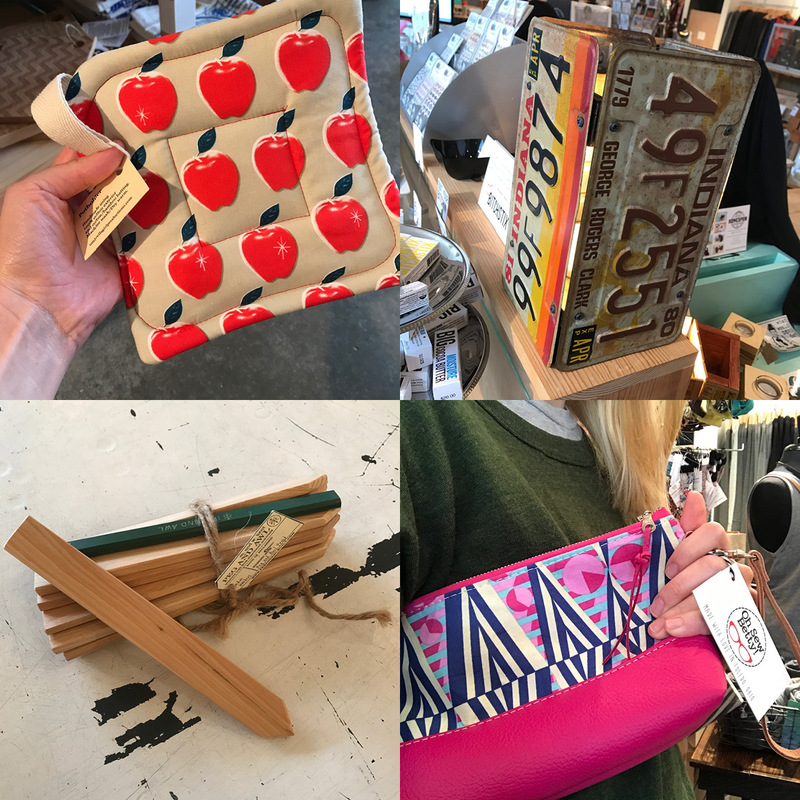 Freshen up your kitchen with one of the many choices of potholders by Umbrella Girl Productions, this new license plate light by Indyardart reminds me of road trips, a bright new clutch like this one by Oh Sew Betty! will fight away the snowy blues, and don’t stop believin’ in that summertime garden with these stakes by Peg & Awl. Two sure signs its spring: our displays are full of plants and animals and our checkout is full of Indianapolis Indians baseball schedules! Our window is complete! So fresh, so springy. Workshop: Intro to Weaving: Saturday, March 18th, 2-5pm: In love with the wool and woven textile movement? Come learn how to be a part of it in this workshop! Woven tapestries have always been very chic and it seems that they are hard to come by, as they are handmade, unique, and cherished. 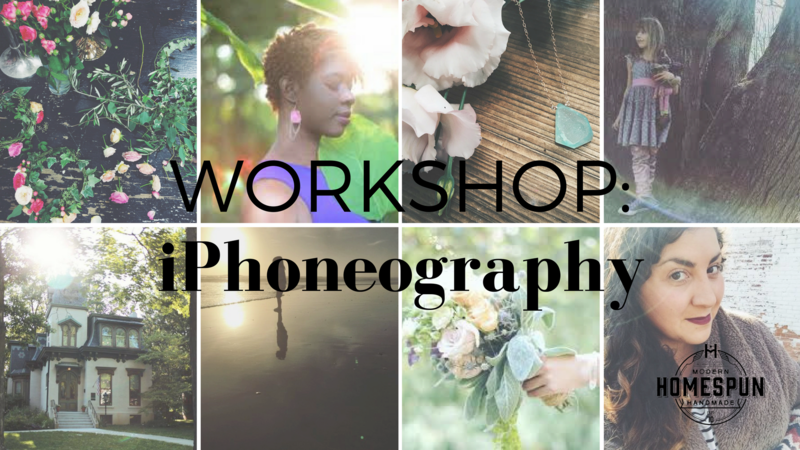 Three perfect adjectives as to why you should take this workshop! Students will learn how to thread a needle and begin a loom, as well as several braiding methods. 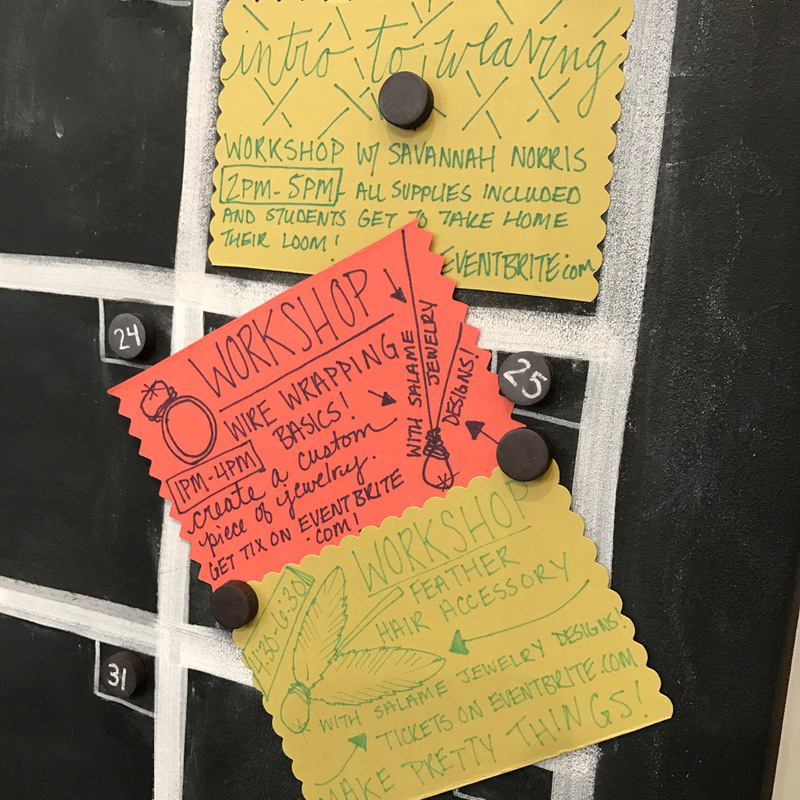 All supplies will be covered in the cost of this workshop, including a handmade weaving loom for each student to take home. Participants may bring 4 balls of their own yarn to make something truly unique! 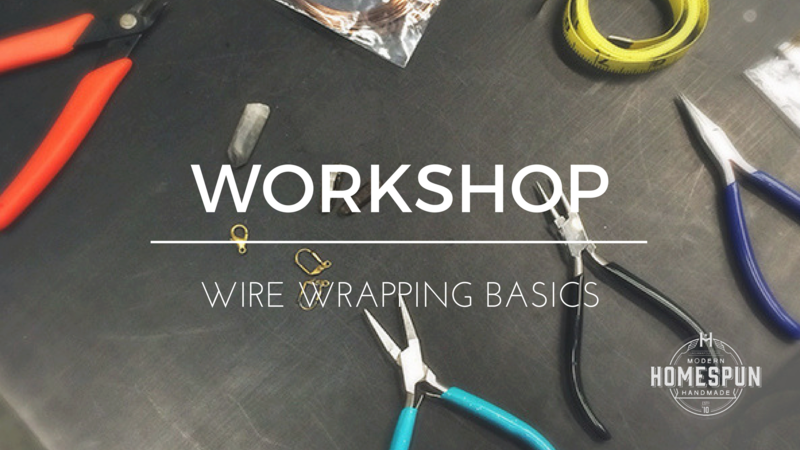 Workshop: Wire Wrapping Basics: Saturday, March 25th, 1-4pm: Have you ever wanted to go on a gem hunt? Well, here is your chance! Rana Salame Striedinger of Salame Jewelry Designs is opening her treasure chest of gemstones for you to peruse and select from to create your own one-of-a-kind jewelry. 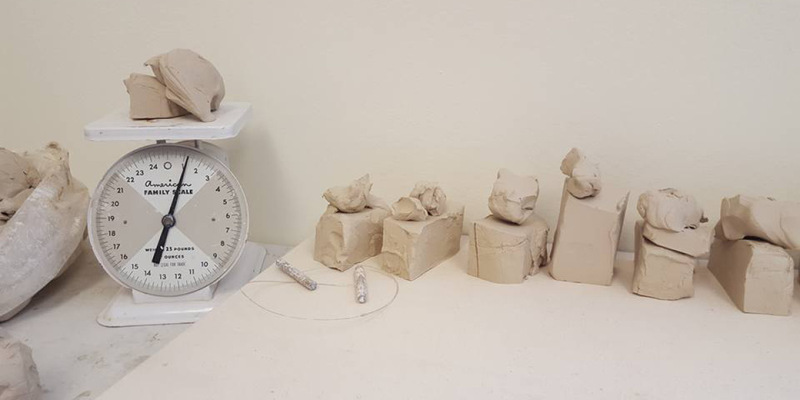 Students will learn several wire wrapping and jewelry assembly techniques to create one unique item. Workshop: Feather Hair Accessory: Saturday, March 25th, 4:30-6:30pm: ly by and wire wrap a few hairpins for your summer updo’s with our resident gemstone queen Rana of Salame Jewelry Designs! Learn a few feather crafting and wire wrapping skills to make three hairpins or a hair comb. The options are endless and there will be a variety of feather, crystal, and metal options to choose from. Sips and snacks provided or you can byob! 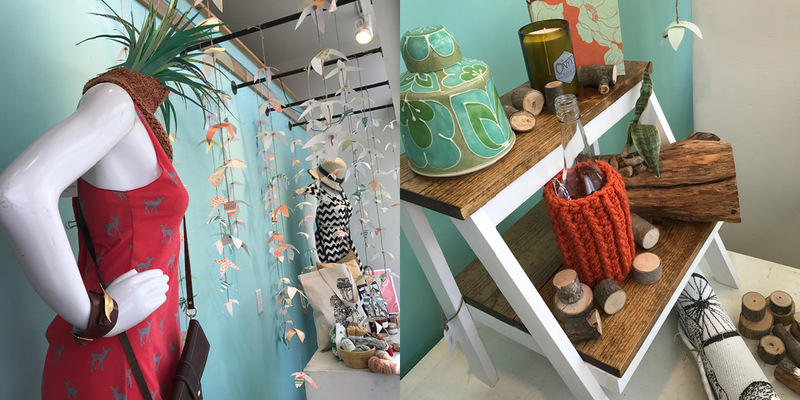 Today the sun was shining in the shop, making everything look bright and new! 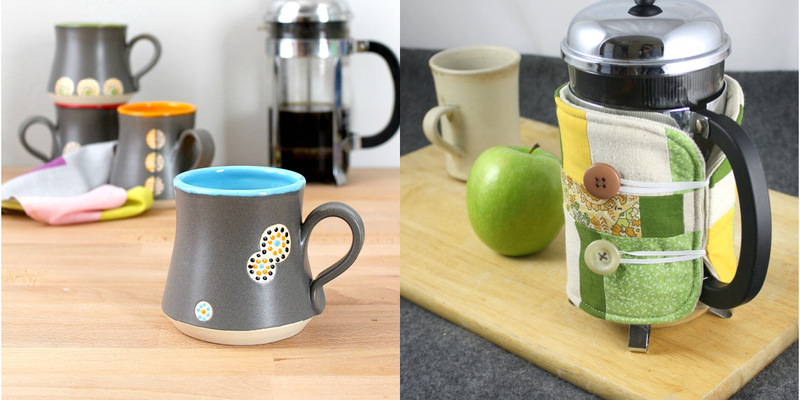 Take a look at some of the glorious new products on our shelves now. 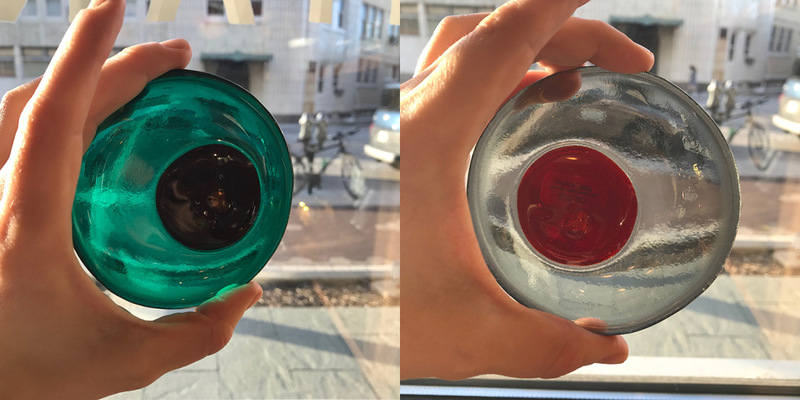 These new pieces from Willow Modern Glassware were certainly not immune to the luminous qualities of the evening sun. 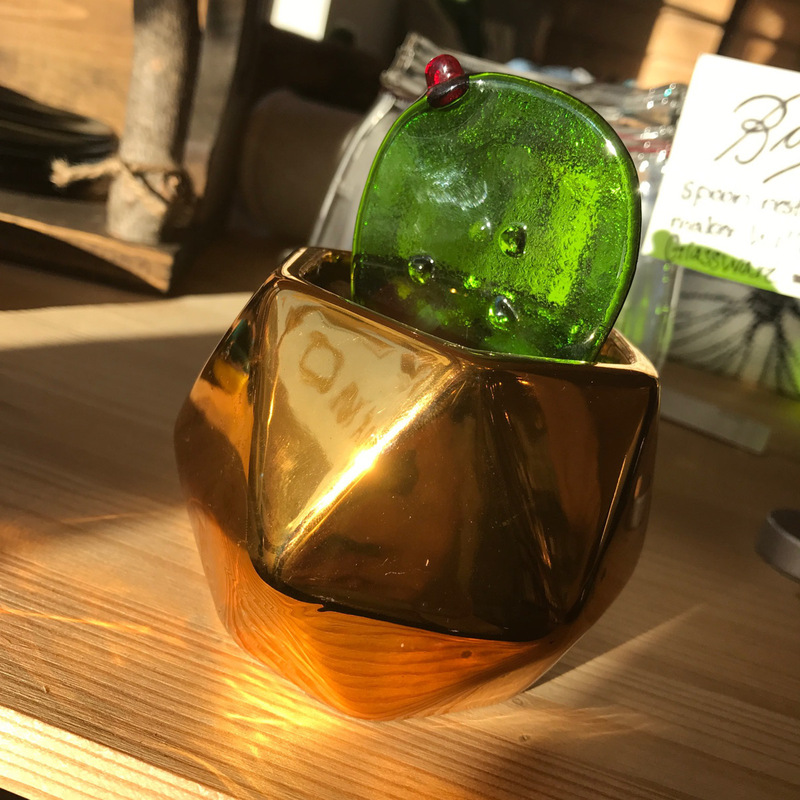 Awesome little glass cactus that will live forever pairs great with these little glass dishes. This wooden lazy Susan by Richwood Creations is covered in springtime flowers! 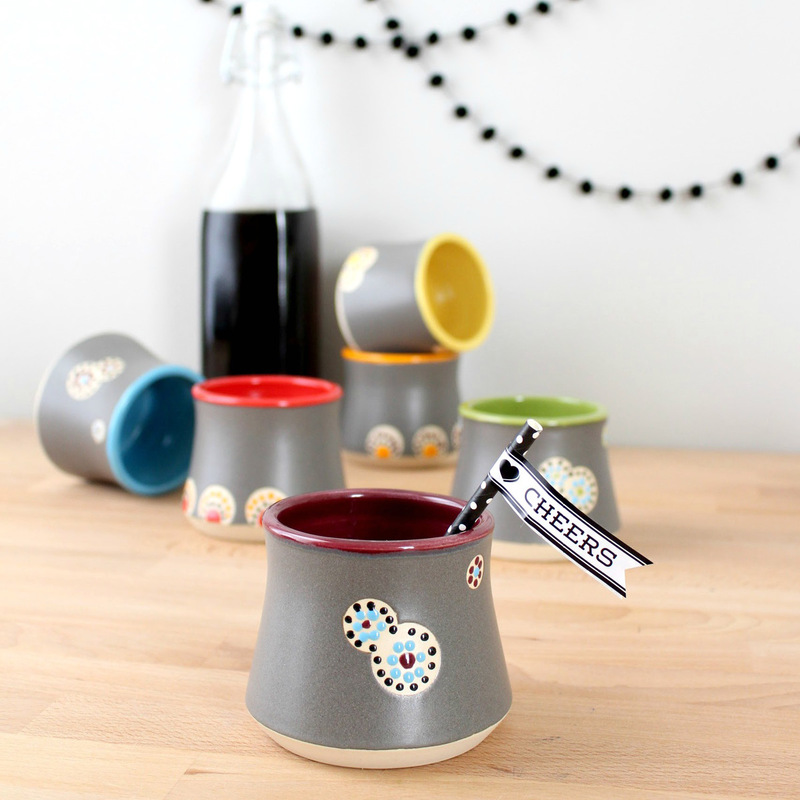 These shot glasses by United State of Indiana are ready to make drinks and sit on the porch with you, and this print by Cordial Kitten isn’t knew, but it is a classic. Also loving these adorable new onesies by Hoosier Proud. 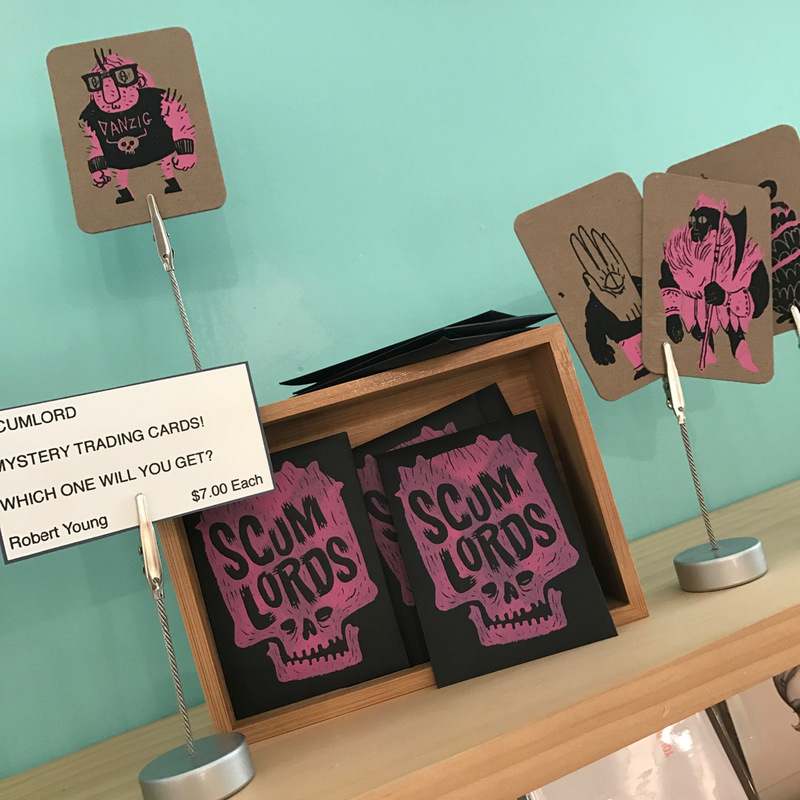 The Scum Lords exhibit by Robert Young is on now and looking BA. Especially loving the mystery trading cards. 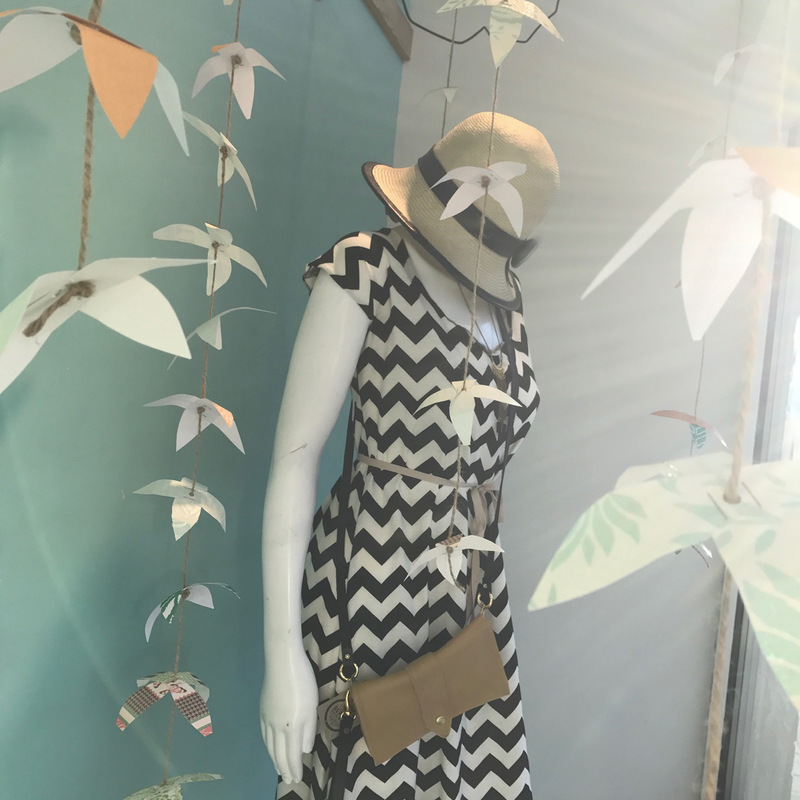 Our new window display is in progress but already glowing. Our sign-work looking sharp and our awesome new doorbell is ready for a little customer interaction!